Examples are given to show you how to use the formulas. Given a square where the length of each side (edge) is 5cm. Find the area of this square. 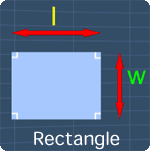 Given a rectangle with the length of 4ft and the width of 3ft. Find its area. Where π is constant that is approximately equals to 3.14. 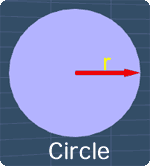 Given a circle with the radius 3cm. Find its area. Take π = 3.14. Given a parallelogram with the base 5in and the height 3in. Find the area of this parallelogram. The lesson on the area of a triangle will explain to you on how to use this formula. 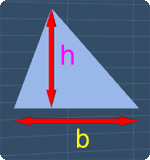 Given a triangle with the base 4cm and the height 2cm. Find its area. Given a trapezoid with the height of 4in, and two parallel sides of 2in and 3in respectively. Calculate its area.